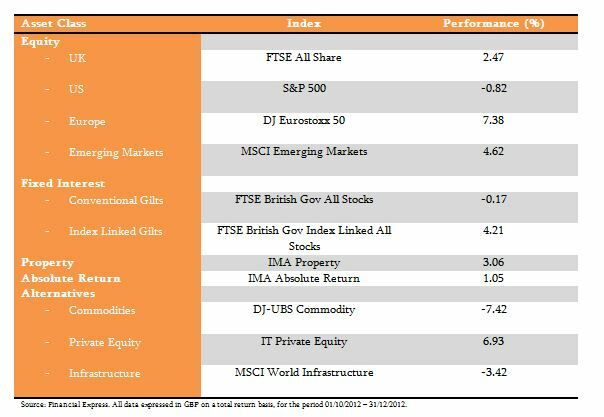 Conventional gilts continued to struggle throughout the quarter, falling slightly, but index linked gilts rebounded from a poor previous quarter to post a 4.21% return. Commodities suffered heavily to end over 7% down, whereas both property and absolute return achieved similar returns to the previous quarter. At the start of October emerging markets started to outperform their developed world counterparts, as not only did interest rate cuts enacted in previous months begin to have material economic effects but investors retained their risk appetites developed in the third quarter. Mid-month saw a significant improvement in Asian trade data – a real economic indicator – with the figures for Korea, China, and Taiwan showing substantial enhancement. The data for Korea was of particular note, as the country has historically been a very good barometer of underlying trends in trade flows given its sensitivity to global supply and demand dynamics. Progression into November brought with it increasing fears surrounding the so-called ‘fiscal cliff’ in the United States, in which the concern was that automatic tax rises and large government spending cuts could tip the world’s largest economy back into recession, with obvious ramifications for the global economy. As a result, the first half of the month was characterised by a rally in government bonds as investors flocked to safe-havens, with equity returns dipping as a consequence. However, the news that the International Monetary Fund (IMF) had reached agreement with the European Union on Greek sovereign debt, in conjunction with positively revised US GDP data, buoyed investor mood to the extent that share price momentum gained traction. December was an eventful month, with a number of notable occurrences. The US Federal Reserve announced it was adding to the Quantitative Easing packages that they previously communicated, and they also took the unusual step of explicitly targeting a specific unemployment rate. In Japan, elections took place, with the LDP party sworn into power, albeit via a majority position as part of a coalition. This outcome triggered a brief period of strong equity market performance, as hopes of increased central bank intervention to boost growth and weaken the Yen were heightened. Nearby neighbours China also generated political news as the new political powers had an economic conference during the month, in which capital market reform was the overriding theme. Our outlook for the first quarter of 2013 is one of cautious optimism, although we are still mindful of the risks that remain. The considerable improvement in Asian trade data is a source of encouragement, as are the tools that emerging markets have within their arsenal to try and kick-start their economies, encompassing both fiscal and monetary policies. However, from a negative perspective, although falling in recent months, risks remain within the Eurozone, and alongside established strugglers Spain, Italy and Greece, the larger nations such as France and Germany may begin to come under threat. Due to the improvement in our outlook, our portfolios are slowly emerging from the asset protection mode they have been in for many months, although not to a major extent. Greater cyclicality is gradually being introduced, evident, for example, in our recent rotation within UK equity out of large cap defensive names into more cyclical small-mid cap stocks. Thus, portfolio changes in the near future, if any, are likely to be of a risk-on nature, favouring the growth asset classes.